Tao of Improv isn’t just a book or concept. It’s a living thing. 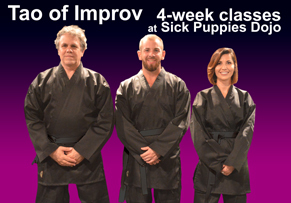 Tao instructors Tom Neile, Sarah Hendricks and Eddie Seage combine their talents and skills to teach a continuous four-week intensive course at Sick Puppies Comedy, Center Stage Theater, Boca Raton. The dojo meets every Thursday, 8–10:30 pm. Each four-week course is self-contained. The course then repeats, with slight modifications each time to keep things fresh. Students can take as many courses as they like, can continue without a break, can take a four-week pause and catch up when it begins again. Unlike with drop-in classes, it’s a complete course, designed to get improvisers to do great scenes and to continuously develop their understanding of their craft. If you’ve taken an improv class anywhere, or if you perform improv at any level, this one-room schoolhouse approach is perfect for you.